Property Owners: List your Upper Normandy property on the premier site specialising in French holiday lets. More Info. View gites and villas in Upper Normandy. Villas in Upper Normandy are well appointed and comfortable. As such, anyone renting one for a holiday is guaranteed to have a most enjoyable stay. Gite holidays are also very popular, and gites in Upper Normandy are always in great demand. For those who like to feel like they are part of the community for a week or so, they are an excellent choice of accommodation. Rouen, the capital of Upper Normandy, is located on the River Seine, and is well known for its picturesque historic centre and surviving half-timbered buildings. Its Notre Dame cathedral is a magnificent Gothic building that was started in 1202, but not completed until 1880 due to an incredible catalogue of natural and man-made disasters that befell it over that time. Amongst its “treasures” is a tomb containing the heart of Richard the Lionheart. Another prominent holy building is the church of Saint Joan of Arc, which dominates the Place du Vieux Marché, the site where she was burned to death. Elsewhere in Rouen, there’s an astronomical clock, dating back to the 16th century, although the movement is from 1389. Among Rouen's many museums is the Musée des Beaux-Arts de Rouen, which features many Old Masters from the 15th to the 20th century, including Velasquez and Rubens, as well as a limited, but good collection of Impressionists. Further Impressionist paintings can be viewed in the towns of Giverny and Le Havre. Giverny was the home of Claude Monet, and a lot of his work is displayed at the Giverny Museum of Impressionism. In Le Havre, you should head for the Musée Malraux, reputed to be the best museum outside Paris for the genre. 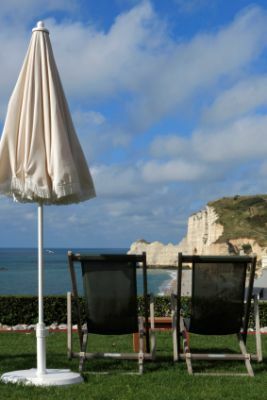 If you’re at the coast, the one place you must visit is Etretat. Situated in the Pays de Caux, it’s famous for its white cliffs, which feature gateway arches and a large needle rock. Beautiful though they are, they’re very fragile, as they’re really no more than the remains of a crumbling and eroding land. With its extensive coastline and inland fertility, Upper Normandy provides a varied diet of rich, tasty food that makes it one of the top cuisines in the country. Seafood plays a large part in the local gastronomy, with such dishes as Hareng Saur and Marmite Dieppoise served fresh. Hareng Saur is a traditional meal of smoked herring, the recipe having been handed down since the Middle Ages. Its distinctive salty taste surprises and delights many a tourist and Frenchman alike. Marmite Dieppoise is the region’s equivalent of Provence’s Bouillabaisse, but the Normandy version contains spices like cayenne pepper, paprika and curry, as well as its own butter and cream. Using only locally sourced fish, it’s a true pleasure for all the senses. Upper Normandy also prides itself on its omelettes, particularly Mère Poulard’s Omelette and the Omelette Normand. The first omelette is savoury, while the latter is made from apples, butter, cream, sugar and Calvados, and is served as a dessert. To make it more of an occasion, you can have it flambéed with even more Calvados, while ordering a side-bowl of local Normandy cider. Cheese lovers will like to search out the Neufchâtel, a traditional, creamy cheese, with a flowered rind and a soft, delicate taste. View villas and gites in Upper Normandy.